A member of both the Putin and Medvedev presidential administrations and now Russia’s G8 sherpa, Arkady Dvorkovich responds to readers’ concerns in a forum hosted by Gazeta.ru. Alexei Subbotin: What are the potential growth segments in the Russian economy? When will the economic crisis be over? Arkady Dvorkovich: We have not yet reached the pre-crisis GDP level, although we have reached the average level of salaries and consumption. The worst of the crisis is, of course, behind us. But that is not the main thing. The key issue is whether we will be able to change the present course. Simply getting back to pre-crisis levels cannot be regarded as a success. In order to overcome the crisis, we must make new high-tech spheres of the economy and agricultural services into growth drivers, while substantially reducing the poverty level. Kirill: How has President Medvedev’s reputation been damaged by the sentence in the second YUKOS trial? Arkady Dvorkovich: It is not for me to judge whether the court decision is right or wrong. I do not work within that system. As regards the actual court ruling, I can say that by no means are all the procedures complete; there will be appeals and hearings at other instances. As for any harm to the president’s image and the reaction of investors, I think we will very soon, in just a week, see and hear everything in Davos, the biggest investment forum, where these questions will be asked of all the members of the Russian delegation and we find out what the investors’ attitude is. I think at least a significant part of the foreign community will have serious questions, and assessment of the risks involved in dealing with the Russian Federation will increase. As to whether the sentence was right or wrong – that is a question that belongs within a different system of coordinates. Opinions may vary on court judgements passed in any country. We will never have an independent judiciary unless we all consider the judiciary to be independent. Independence is not about the letter of the law; it is about the people’s attitude to the law courts – above all, perhaps, the attitude of bureaucrats, because they have potentially greater leverage, and of businessmen, at least major ones who, as we know, often try to bribe the judges. Also of ordinary citizens who choose to go or not to go to a court of law because they think it is fair or unfair; and of judges, who either have or do not have a sufficient sense of inner freedom and independence. All these factors determine the independence of the judiciary. We should all of us work to make the courts independent, rather than looking to the state to do it. Gazeta.ru: One of Medvedev’s major initiatives was to soften the economic crime legislation. The latest ruling does not seem to be in line with that trend. In general, the impression is that the amendments are not working. Is that really so? Arkady Dvorkovich: First, the president’s initiatives concerned petty and less serious crimes. The law lists these crimes and an expanded list of the same set of crimes is pending before the state Duma. Statistics do reveal a trend, as there are now fewer arrests than before. I think non-custodial measures are more frequently chosen. I believe that, in many cases, the sentences will be softer, while sentences for crimes committed against people will be harsher. P.G. : Is the uncertainty due to the upcoming elections causing an outflow of capital? What is your forecast? Arkady Dvorkovich: Last year saw a significant outflow of capital – almost $40 billion by a tentative Central Bank estimate. A new trend noted by experts last year consists of capital outflow in average-sized amounts from the regions, rather than from Moscow. This bears out the conclusion drawn by the president, among others, to the effect that our investment climate is very bad. That is certainly the opinion of those who buy foreign currency, businessmen and parties to financial transactions. Many, indeed, think the prospects for doing business and investing in the Russian Federation are dim. This is confirmed by the investment growth figures. There has been some growth, but we have a long way to go to reach the pre-crisis level of investment. Should this be attributed to uncertainty generated by the future elections? Perhaps – up to a point. Many associate their plans with who will be the minister in charge of their particular sphere, with what plans will be implemented, and there is a considerable spread of opinions on these issues. I think it has to do with the fact that there has been no improvement in many regions and that corruption is rampant in many places, rather than the approaching elections. Gazeta.ru: Could this be due to the growing economic role of the state and the greater role of the state in general as well as inadequate protection of private property? Arkady Dvorkovich: I think not enough market competition is closer to the truth. That is, the opportunity to compete honestly and fairly with investors on the market. Including government-owned enterprises. This is a significant factor in many, though not all, cases. We see some private entrepreneurs using a variety of means, sometimes corruption, to gain an unfair advantage, sometimes gaining a competitive edge on the market. Sometimes there is outright crime. I agree that the state is often present in one form or another and plays a part. Gazeta.ru: We have discussed one factor that might have influenced the capital outflow in the year before the election. There are two other factors that might have made a difference. We have discussed the sentence on Khodorkovsky, which casts doubt on the efficacy of protection of big business by the courts in our country. The second factor is the high-profile sacking of [Yury] Luzhkov, demonstrating the vulnerability of the assets of high officials, who may or may not be corrupt. Arkady Dvorkovich: First, I don’t think these factors significantly influenced the outflow of capital last year, but it remains to be seen what will happen this year. The main outflow took place long before the sentence, which was announced at the end of December. Second, speaking about dismissals, one should distinguish perfectly legitimate outflow of capital simply to purchase foreign assets. However, if some officials transfer their ill-gotten gains abroad in anticipation of being fired that is a presumed crime. It does not belong in the same category as capital outflow. It is hard to say which part of capital outflow is legitimate and which is not. But I think, for the most part, we are looking at legitimate actions or transfer of money earned over many years. Even if, at some point, the money was earned illegitimately, the statute of limitations has long since expired. I am talking about business. I believe that, given the president’s assessment of the [former] Moscow mayor, dismissal was the logical way out of the situation, regardless of its impact on the outflow of capital. I think the majority of private investors operating in Moscow with no connections to the Moscow government will take the opposite view. They have been given hope that Moscow will provide a level playing field. That said, doing business in any big city – be it New York, London or Paris – always involves greater risks. And this work is invariably dependant on who is in charge of the city. Alexei: The mega-deal between BP and Rosneft, which was rushed through over the weekend, looks like an attempt to protect assets. Am I right? Arkady Dvorkovich: I was not aware of that particular deal until it came through. I do know, of course, that Russian and foreign oil companies are in constant consultations over a variety of projects. Such transactions make good sense. Indeed, since 2006, we have stressed our interest in asset swaps in the oil and gas sector and we have steadily moved in that direction. The deal fits neatly into that pattern. I believe such deals should be normal practice, although some external motives may be discerned in them. They are apparent in this particular case but, I repeat, it is an absolutely logical deal in commercial terms. I think it is a high-profile deal on the global investment market. If everything works out as planned, it may well be one of the stellar deals of 2011. It is a logical step not only in terms of exchange of assets in the oil and gas sector, but also in terms of privatization. You know, of course, that the president and the government have announced plans to privatize big chunks of state-owned companies, including Rosneft. We thought VTB would be the first, but Rosneft beat them to it. Although I don’t know which deal will be made faster. This deal may whet the appetite of investors for other state assets. Anna Alexandrova: To what extent will the state of the economy determine who will become Russia’s president in 2012? Arkady Dvorkovich: The opinions I expressed in the BBC interview were strictly my own. Let me repeat that the outcome of the 2012 presidential elections and the decision by any given candidate to run will be influenced by many factors: the state of the economy, personal track record and public opinion. I would not presume to predict how these factors will play out by the end of 2012. I consider it pointless to speculate as to who will run for president. Both the president and the prime minister have spoken about this more than once and have said enough to provide experts with food for thought on the topic. Stanislav: Do you believe Vladimir Putin is a credible prime minister? Arkady Dvorkovich: There are two ways of assessing the performance of any prime minister, in Russia or elsewhere: Has the situation inside the country improved or not? And how does his performance compare with that of counterparts in other countries? According to most objective economic indicators, the situation in the Russian economy has improved over the last two years. It has been improving faster than in most other countries hit by the crisis. From that point of view, the prime minister’s performance has been effective. It is not for me to judge whether it was effective enough. If I understand the Russian legislation correctly, this is the prerogative of the Russian president and the elected parliament, which hears the government’s reports. We have, though, discussed the many problems that exist, including the investment climate. Of course, as the prime minister himself has admitted on many occasions, the government bears its share of the responsibility for this. So, I don’t think even the prime minister would describe the government’s performance as perfect. Having said that, I repeat that my general assessment is positive. Kirill Sergeyev: Will Russia ever join the WTO? Denis: What areas, let alone innovation, will play a chief role in fostering Russia’s economy over the short term as part of modernization plans? Arkady Dvorkovich: One might say that, for us, the WTO is a lucrative deal. The pluses from joining the WTO outweigh the risks, in the first place because the WTO will enable us to play according to the same rules. It will allow Russia to be treated by investors as a country with a civilized legal framework for doing business. But, as we have said more than once, we are not going to trade our interests for WTO membership. We believe that virtually all the substantive talks have been held and all the positions have been set out. As you know, we are, at the same time, creating trade and other economic alliances with our neighbors, negotiating free trade zones and a common economic space with the European Union. If, against all the odds, we do not join the WTO, the body of these agreements and regimes will provide an alternative. But it would be better to combine these alliances with WTO membership for Russia. Mikhail: Eight years ago, an oil price of $20 per barrel ensured a balanced budget. Today, there is a deficit even with the oil price at $100. At this rate, where will we end up? Or are we waiting for the price to hit $200? Arkady Dvorkovich: First, we have, indeed, come a long way since 2000; we have increased budget spending, this enabling us to raise pensions, finance the education and healthcare systems and build many elements of the infrastructure. That is why the price of $20 no longer ensures a balanced budget. If the price is $100, we will not have a deficit; the budget this year assumes a price of about $80 per barrel. I think a price range of $60-100 is absolutely normal for the world economy and both producers and consumers will be comfortable within that range. Pyotr: Regional authorities have been ordered to sell media assets. Should the Moscow TVC channel be sold? Is the Federal Property Agency [Rosimuschestvo] likely to divest itself of such media outlets as VGTRK, Channel 1 and so on? Arkady Dvorkovich: The question is not quite correct. The president has recommended the regional governments to privatize all the assets not connected with performance of their functions. Priority is given, of course, not to media assets but to many enterprises that belong to the regions, undermining the competitive environment and stunting the growth of private business. Meanwhile, the regions continue to milk the federal budget for more and more subsidies, even though they can raise funds through privatization. This is a priority. The question of media assets at the regional level should be handled on a case-by-case basis. If there is a sense that people have access to information even without the regional government owning media outlets, certain assets can be privatized. If there are no other quality information sources, one should tread more warily and, first, find a way to ensure that the media outlet is not privatized out of existence. Proceeds from privatization go, in any case, into the privatizing government’s budget. They are then used in accordance with the regional budget law to finance any spending envisaged by that law. At the federal level, because we know our priorities in increasing spending, we understand how the proceeds are spent, notably on social measures and on state security. Pyotr Levchenko: Why did you choose to go into the civil service rather than into business? Arkady Dvorkovich: Business, in the traditional sense, does not interest me. I have worked with a commercial company that rendered consultancy services to the Finance Ministry, the Government and the Central Bank. If I were to choose, I would rather choose not between government service and business, but between the civil service and non-commercial activities, for example, in the education sphere. Vadim Artamonov: You are a member of the team that runs the country. To what extent do you feel consider your responsibility for the fate of Russia now and after you are gone? Arkady Dvorkovich: Of course I feel responsible. As long as I feel that I can do more good than connive at what is bad, I remain in government service. Alexander Polyansky: Do you consider yourself to be a member of Putin’s or Medvedev’s team? Arkady Dvorkovich: First, I think that the good things that have been done should be credited to the team I work with, the people above me and below me who have put their trust in me, and also to the commitment to some important, universally accepted values. The team shares these values. I join a team on the basis of competence, decency and whether the people and I share the basic values. Second, I am a member of the president’s team. 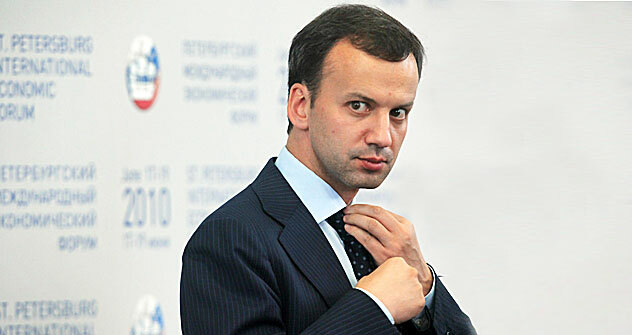 Arkady Dvorkovich was born in Moscow on March 26, 1972. He graduated from the Economics Faculty of Moscow State University with a degree in economic cybernetics and earned a Master of Economics degree from the Russian School of Economics. In 1997, he received a M.A. in economics from Duke University in North Carolina. Since May 2008, he has served as an adviser to President Dmitry Medvedev and as the president’s representative for the affairs of industrialized states and liaisons with representatives of the G8 leaders. From 2004-2008, he was chief of President Vladimir Putin’s Expert Directorate. Before that, from 2001-2004, he was Deputy Minister for Economic Development and Trade of the Russian Federation. He is a State Counselor, First Class, and President of the Guild of Investment and Financial Analysts.